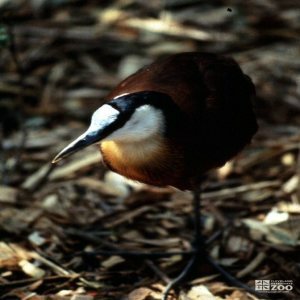 The range of the wattled jacana is Panama to Bolivia, N. Argentina and Uruguay. Wattled jacanas inhabit floating vegetation and grassy areas. Wattled jacanas are water birds characterized by their striking plumage and extremely long toes and claws, which enable them to walk with ease on floating vegetation and on the leaves of water lilies. (They are sometimes called “lily-trotters”.) They forage while stalking from leaf to leaf, occasionally jumping over a patch of open water with the help of a flick of the wings. Jacanas are sedentary birds, without any well-defined migrations. Like other birds dependent upon water, however, they are obliged to wander if their pond or marsh dries up. They walk on lily leaves and floating vegetation with a high stepping gait and jerking tail. Quick darts of the beak are made for insects, or picking up seeds. They poke under the water’s surface for crustacea or small snails, and often turn over the edge of a lily leaf to examine the underside. Bees are always dipped in water before being swallowed. Polyandry (females mating with more than one male) is common among wattled jacanas, with a reversal of the role of sexes. Males establish small territories which are defended against other males by strident calls, chases with upraised wings, and even aerial attack. Males build the nest unaided by females. The nest is made of water weeds, a low raft usually on floating vegetation, but sometimes a pad in a tussock at the water’s edge. The female visits the nest to lay her eggs, then departs to consort with a neighboring male and lay a clutch for him. Generally the male incubates by himself. Newly-hatched young are carried under the wings of the adult. The young are helpless when hatched. By two days the chicks are fairly agile and can follow the adult. At three days they can run swiftly over lily pads, and then forage with the parent.